Are you tired of mechanic piano playing? Do you think that modern pianists resemble a crowd of equal people looking like an Agent Smith? Do you dream of meeting a musician with unique artistic individuality, extraordinary skills in performing classical music who is at the same time passionate for what he is doing? 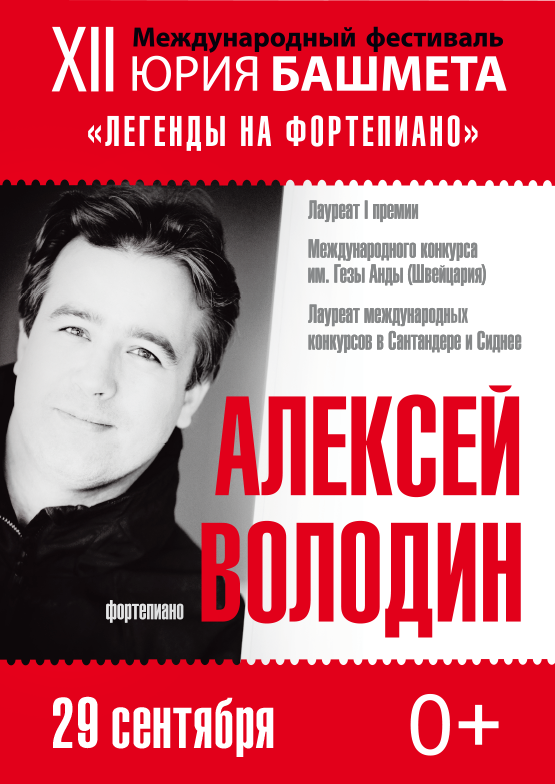 Alexey Volodin comes to Belarus for the first time. Alexey is from Saint-Petersburg and he is 40 years old. He began to study piano playing at the age of 9 at Evening music school and after leaving for Moscow studied at Gnesin Moscow Secondary Special Musical school and later at Tchaikovsky Moscow State Conservatory (class of Eliso Versaladze). The year 2003 was a very significant one for the pianist. After the victory at the Geza Anda International Piano Competition (Zurich, Switzerland) he became one of the most prosperous pianists of the world. Volodin performed in the best halls of the world, including Wigmore Hall (London), Concertgebau (Amsterdam), the Philharmonie de Paris and the Great Hall of Tchaikovsky Moscow State Conservatory. Since 2007 he has been an exclusive artist of “Steinway&Sons” company, the world best piano producer. He worked together with conductors Valery Gergiev, Lorin Maazel, Marek Janowski, the State Borodin Quartet, violinists Julian Rachlin, Janine Jansen, cellist Mischa Maisky. It is a great pleasure for the musician to perform at the Concert Hall of the Mariinsky Theatre. This was the concert hall where he played all Beethoven concerts at the same time and where his famous concert programme “Shakespeare in music” took place for the first time too. Volodin’s repertoire is really impressive and this allows him to show various aspects of himself in the public. Very often people call Volodin a virtuoso and a thinker and compare him with Richter or Rachmaninov for his impressive skills, melodious rich sound, bright and fresh interpretations. It seems that the compositions by Bach, Chopin or Beethoven, performed by Volodin, look like they used to look like when had just appeared. “Having a working experience with such great musicians as Paul Badura-Skoda, Barry Douglas, Nikolai Lugansky we are very glad to see Alexey Volodin at our festival”, says the artistic director of our festival Rostislav Krimer. “I’m sure that the public will be very excited!”, he adds.